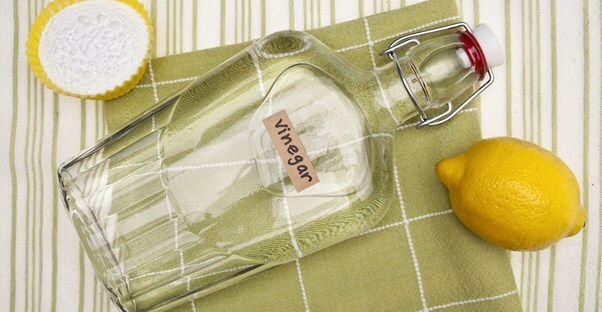 Vinegar and essential oils can be used to mop your floor. You will need a bucket full of warm water, one cup of vinegar and a couple of drops of essential oils, such as lavender oil or chamomile oil. After the floor has dried, the vinegar smell will go away. You will need one cup of vinegar and one cup of baking soda to clean your toilet. The first thing that you will need to do is pour the baking soda in the toilet. Let it sit for at least one hour. After that, you will need to pour the vinegar in and let it sit for at least five minutes. Flush the toilet. You will probably be able to clean your toilet without scrubbing unless it is very dirty. Baking soda and vinegar can also freshen a smelly drain. Sprinkle a little bit of baking soda down the drain. After that, you will need to pour a few cups of vinegar down drain. Baking soda and vinegar can also help unclog a drain. You will need to sprinkle some baking soda in your bath tub and along the shower walls. You will then need to wet a sponge and scrub the area. Rinse the tub and shower out with water after you have finished cleaning. If the tub has mold or mildew, then you should apply vinegar to the areas before cleaning and let it sit for about 10 minutes. All you need is water and baking soda to clean your oven. You will need a create a paste of water and baking soda inside of the oven and allow it to sit for a few hours. After you have let the paste sit for a few hours, you will need to wipe out the oven. You will need to fill your sink with hot water and add one cup of vinegar. Allow it to sit for 30 minutes. After that, you will need to create a paste by mixing the baking soda and water. Scrub the sink with this solution using a sponge. Place a little bit of olive oil on a rag and rub the sink down. This will make your sink beautiful and shiny.